This is a guest post by Paul Thomas. ‘33’ years have passed since SCRATCH first appeared on a blank sheet of paper. Now is the time to celebrate and bring together his history in one place in Devon, the Totnes Library. It’s another world since his first film for TAKE HART was broadcast on the 23rd of March 1983. It had been made at BBC TV Centre, a dream factory in West London. Once the selection from a vast archive of material was made I realised this would be the first time ever the collection would be seen. 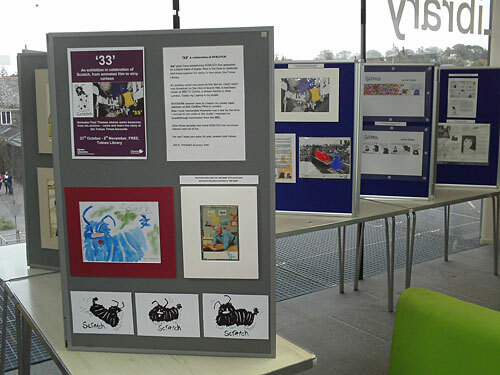 It was overwhelming to see the story of SCRATCH on display hoping to enchant the public. 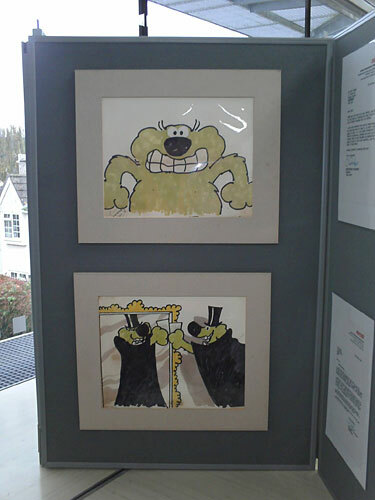 The exhibition opens with ROOBARB. He appears as I began my career aged eighteen at Bob Godfrey Films in London. Bob’s most memorable character was a star by the time I arrived. It was while at this studio I received my breakthrough commission from the BBC. Paul Thomas introduces the exhibition. The exhibition celebrates too the creative process of the animated film from idea to transmission print. Included are letters from the BBC. A storyboard and script. Production cels. 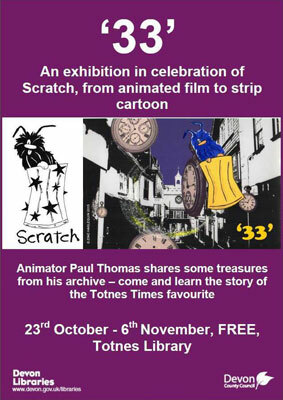 The strip cartoons with over two hundred published in the Totnes Times and the life size cut out of SCRATCH in his Yellow Dustbin. With such a time span of thirty three years the process and the TV show are history. 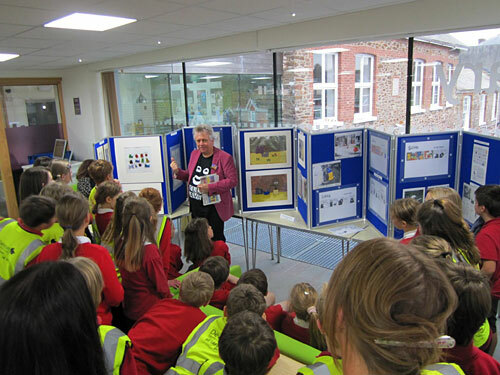 They are also educational and my audience after the exhibition was opened by the Mayor of Totnes was St John’s C of E Infant School in Totnes. I enjoyed the many questions and was very pleased with the attention the children paid to my story. It was also an opportunity to pay tribute to Tony Hart, Bob Godfrey and make a reference to Kate Bush. A recent image of SCRATCH as a comet has been very inspirational. I set up a project for the children to design the comet tail following the head I painted on A3 paper. It will be a long piece of work and have its place on the library wall for a while before being put up at the St John’s school. It’s been quite a journey from an alley behind BBC TV Centre to Totnes high street yet after three decades and more SCRATCH has remained vibrant and full of fun. He and I hope you enjoy his past, present and future.